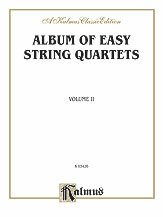 Titles are: BACH (Sarabande from the first French Suite) * BACH (Loure from Third Suite for Cello) * DITTERSDORF (Minuet from Quartet in E-Flat major) * HAYDN (Adagio from Quartet in G Major) * HAYDN (Minuet from Quartet in D minor) * MOZART (Ave Verum Corpus) * MOZART (Andante from Quartet No. 8) * MENDELSSOHN (Intermezzo from Quartet, op.13) * MENDELSSOHN (Song Without Words, No. 35) * SCHUMANN (From the Album for the Young) * SCHUMANN (Song, ‘To Sunshine,’ op. 36) * SCHUBERT (Moment Musical).